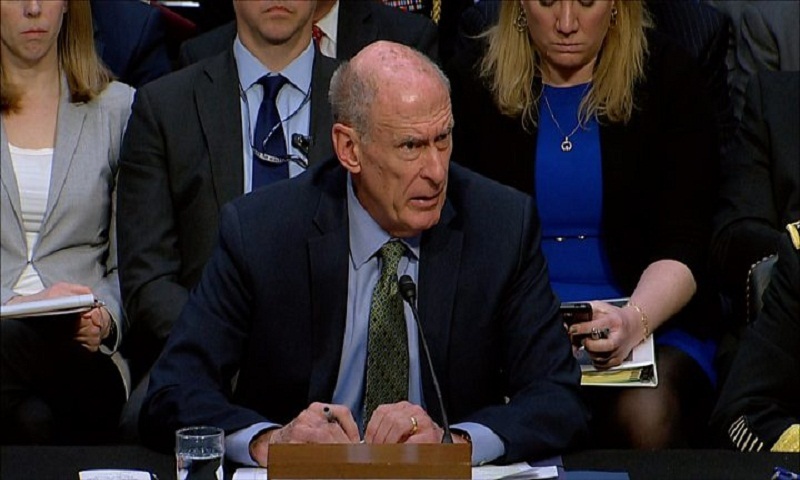 Mr Coats was one of several spymasters who gave evidence on Tuesday to the Senate Intelligence Committee about global threats facing the US. "Sometimes it is necessary to have some type of preliminary clearance in order to fill a slot," the US director of national intelligence said in response to a question from Democratic New Mexico Senator Martin Heinrich. In Tuesday's hearing, FBI director Christopher Wray appeared to contradict the White House's account of when it knew about the allegations against the president's gatekeeper, which he denies. Mr Wray said the bureau notified the White House about problems in Mr Porter's background check in March last year. That is months earlier than the White House said it received the information. Mrs Sanders later disputed the FBI timeline, saying that the background check had not yet been completed. Mr Wray also said the FBI delivered the final results in January of its background investigation into Mr Porter. But the White House said last week that Mr Porter's background investigation was "ongoing" at the time he quit. The White House is also facing questions about presidential adviser Mr Kushner's access to classified material. Despite his lack of a full security clearance, Mr Kushner is able to read the President's Daily Brief, a top secret intelligence report that Mr Trump himself does not bother to read, according to reports. Mr Kushner is one of dozens of White House employees still awaiting permanent clearance, according to the Washington Post. His lawyer, Abbe Lowell, said the 37-year-old's application is taking longer than usual "because of the extent of his holdings, travels and lengthy submissions", according to the newspaper. The wealthy New York real estate developer has had to refile the national security questionnaire required of all prospective White House employees after making a number of omissions. Last October, the head of the National Background Investigations Bureau told Congress he has "never seen that level of mistakes" on any security clearance application, reports BBC.